Perfectly situated on a conservation homesite, this is one of the most sought-after floor plans in Live Oak Reserve. Three-way split plan with 4 bedrooms, 3 baths, office, kitchen, living, dining and family rooms all on the first floor and a spacious upstairs bonus room perfect for game night! Separate formal living and dining rooms. Light filled, updated kitchen open to family room with beautiful pool and conservation views. Master suite offers dual closets with custom built-ins complimenting the walk-in closet. Elegant bathroom with dual vanities, garden tub, and large walk-in shower. Tray ceilings. Two of the secondary bedrooms offer walk-in closets. Private screened pool and lanai provides a perfect place for outdoor entertaining. Laundry room with cabinets and laundry tub. New roof 2017, larger A/C unit and water heater replaced in 2018. Epoxy garage floor. Termite bond. 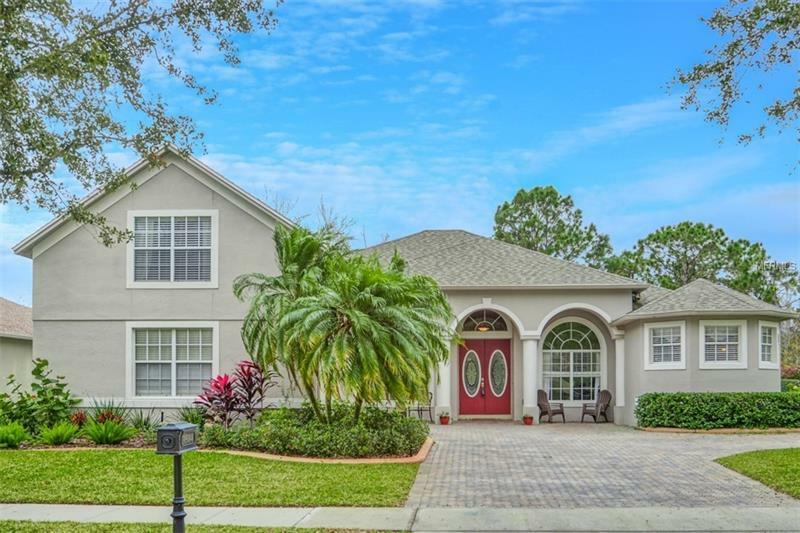 Enjoy the Live Oak Reserve lifestyle with clubhouse, recently updated gym, basketball and tennis courts, community pool with water slide and splash pad, and baseball and soccer field. Top schools, and short walk to elementary school. The one you'll want to call "Home!"